Before the game got underway, Girl Scouts’ National Board of Directors member Lynn Gangone and Al Smith, Jr., TFS group vice president of Service Operations & Corporate Planning, joined three Girl Scouts from Girl Scouts Nation’s Capital to highlight and raise awareness about the program. Driving My Financial Future teaches girls financial literacy basics like negotiation skills, budgeting tools, and how to establish and maintain good credit; it also helps them learn to navigate the loan and financing process. 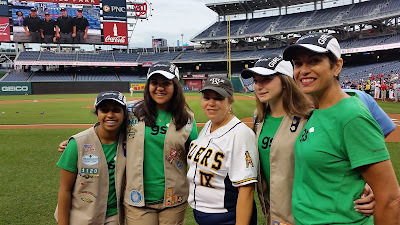 Out on the field, Lynn and the local Girl Scouts were able to meet some Congressional members who were warming up, including the only female member of Congress playing in the game, Rep. Linda Sanchez (D-CA), whom they wished good luck ! 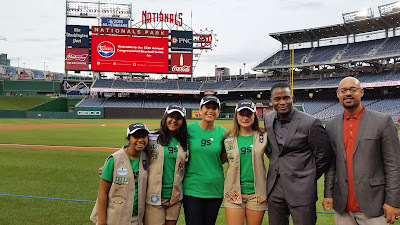 Shortly before joining forces at the baseball game, on June 14 Girl Scouts and TFS joined together on Capitol Hill to celebrate the 100th anniversary of Girl Scouts’ highest award, recognizing the amazing girls and women who have earned the Gold Award, in its various iterations, over the past century. The centennial celebration, paired with the Congressional Baseball Game, served as a great platform for educating members of Congress and everyone in attendance about the important work that Girl Scouts and TFS do to equip girls with financial literacy and leadership skills. Now that’s a win in our book!